How Valuable is the Best 6th Man in the League? Being a starter on a basketball team has its perks. You generally get more playing time, you’re regarded as one of the key players on your team, your coach trusts you to help get your team off to a good start, and, if you’re a pro, you get your name announced in a cool way during the player introductions while you do some fancy high-fiving and spinning chest-bumps. But what about the team’s next most important player? The unsung hero. The guy who comes off the bench first and gives your team a spark. The catalyst who comes in when the team needs a boost of energy and an alteration in their match ups and schemes. 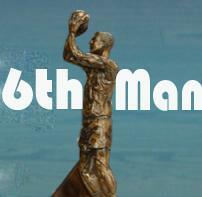 The sixth-man is one of the most important positions in basketball. Heck, the league eventually/finally decided to acknowledge it with it’s own award nearly 30 years ago. This infographic delves into the history of the NBA’s past 6th-man award winners and compares their performances in both the regular season and playoffs. While the role is certainly valuable, it is interesting to note that only once since 1986 did a team with the best 6th man win the NBA championship in the same season (Toni Kukoc – 1996). To embed this infographic click in the box below then hit Ctrl-C to copy.